Cool Robots, created by a (mostly) Dartmouth team lead by Professor Laura Ray, are not merely "nifty," "happening" or "phat" - or any other synonym for "cool." Cool Robots are lightweight autonomous bots that are designed to prowl the coldest environments on Earth. 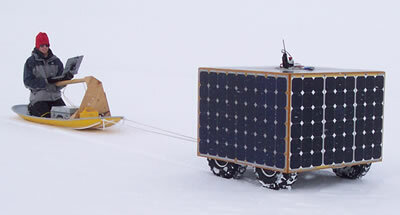 Cool Robots can easily haul their own weight (200 pounds) through the snow at a typical slow walking pace. Max capacity for freeloaders or freight is about 400 pounds. The external box of the robot is approximately a one meter cube. It is effectively made of solar panels on four sides. The floor houses control and drive systems, driving the all-terrain tires. 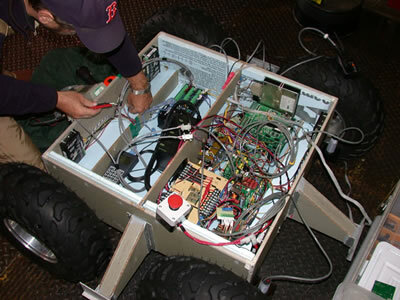 As you can see, the interior of Cool Robots is a rats nest of wiring and circuit boards. Cool Robots remind me very strongly of a winterized version of Robert Heinlein's steel tortoise from his 1940 story Coventry. It could maintain a steady six miles per hour on smooth, level pavement. When confronted by hills, or rough terrain, it did not stop, but simply slowed until the task demanded equaled its steady power output. The design goal for Cool Robots is to create a lightweight mobile robot that enables deployment of instrument networks in Antarctica. One can envision deploying multiple robots from the South Pole to desired locations on the plateau for long- or short-term observation, and retrieving or repositioning the robot network through Iridium-based communication. 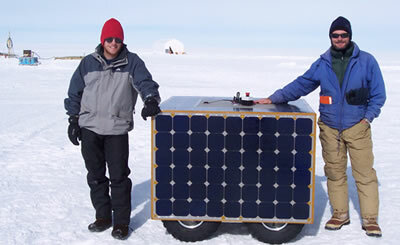 Potential missions include deploying arrays of magnetometers, seismometers, radio receivers and meteorological instruments, measuring ionosphere disturbances through synchronization of GPS signals, using ground-penetrating radar (GPR) to survey crevasse-free routes for field parties or traverse teams, and conducting glaciological surveys with GPR. Robot arrays could also provide high-bandwidth communications links and mobile power systems for field scientists. Read more about Cool Robots at Dartmouth. Also, be sure to check out this promising new sport - Extreme Cool Roboting.